I’m finished with the “white carb detox”! For those of you who didn’t see my beginning post, I basically decided to eliminate sugar (except for fruit) and white flour from my diet for 3 whole weeks. I can’t say that it was always easy and I won’t lie and tell you that I didn’t have any slip-ups (there was one illicit piece of pillowy focaccia bread and some nasty frozen pizza at a crazy party). Nonetheless, I am 100% glad that I did my very best for 3 weeks. By the end, I was eating a ton of vegetables and healthy protein and fat, I was feeling satisfied and energetic, and the dreaded belly bloat was almost nonexistent. Too bad I wasn’t able to go to my 5-year college reunion…I was looking good! Fry the zucchini: Heat oil in a large sauté pan over medium-high heat. Gently add slices of zucchini in batches and fry for about 2 minutes on each side, until golden. Place on paper towels to drain. Cook the edamame: Bring a pot of water to a boil and add edamame. Cook for 5-7 minutes, drain, and place in a large bowl. Cook the pasta: Refill your pot with salted water and bring to a boil. Add pasta and cook according to package directions until al dente. Drain, rinse with cool water, and place in the bowl with the edamame. Make the dressing: Combine 1 cup of basil, all the parsley and olive oil in a food processor. Puree, scraping down the sides as needed. The dressing may not be completely smooth and uniform…that is ok. Put it all together. 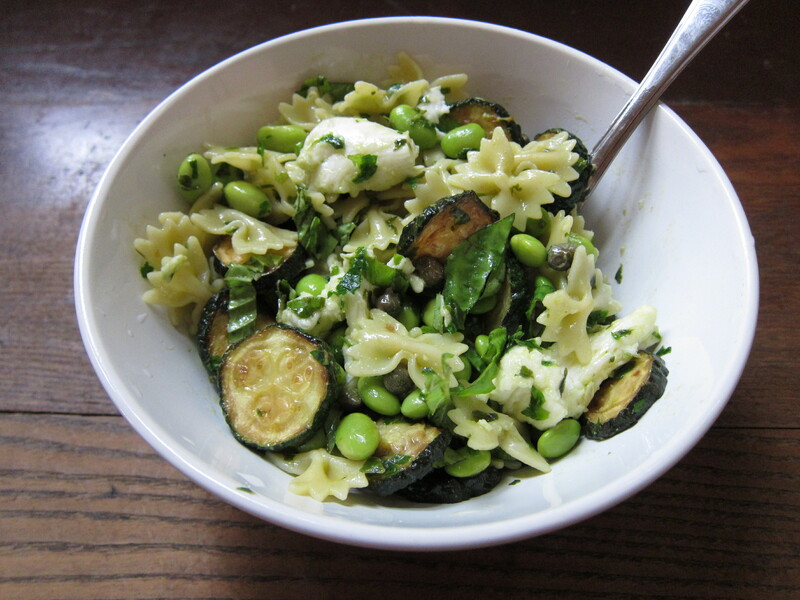 Add the zucchini, red wine vinegar, and basil dressing, lemon zest, and capers to the pasta and edamame. Stir well. Season to taste with salt. Add the mozzarella and remaining basil before serving. * I shared this post with this week’s Full Plate Thursday. 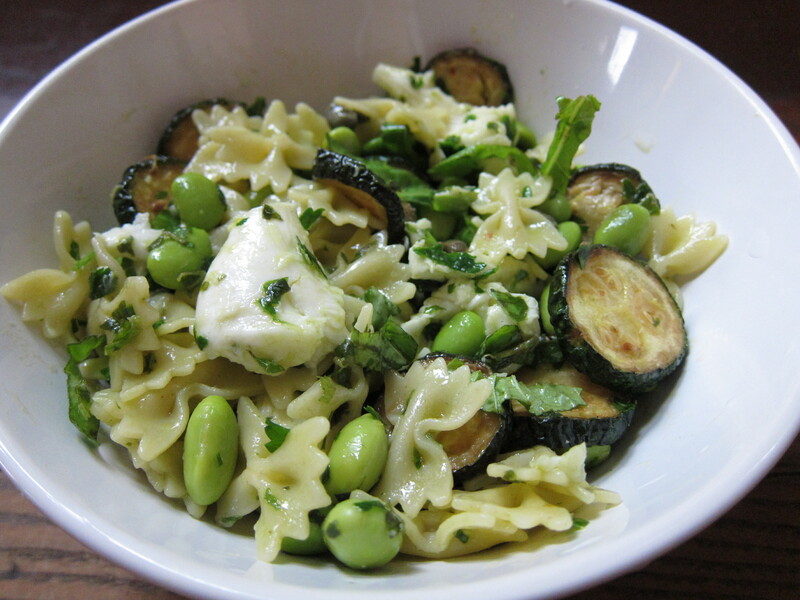 This entry was posted in Uncategorized and tagged pasta, Pasta salad, recipes, vegetarian, Zucchini by hännah. Bookmark the permalink. 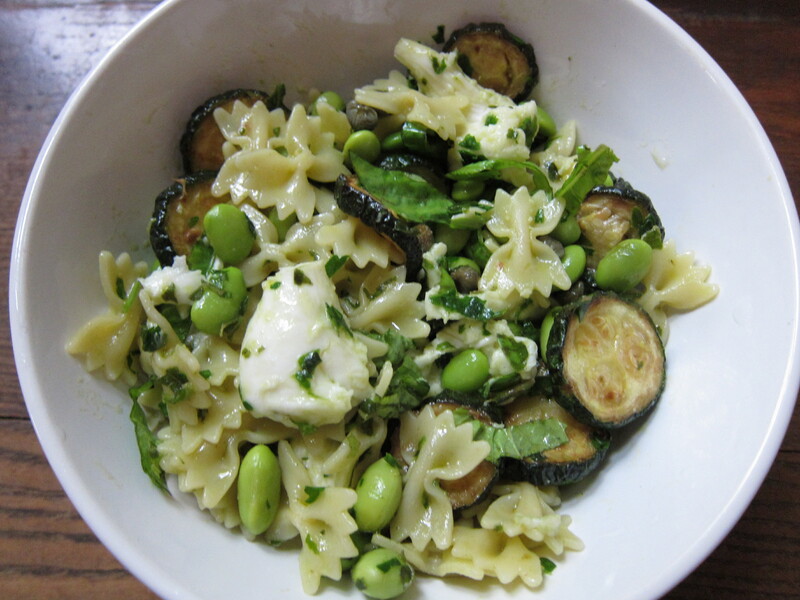 This is the kind of food I love – thanks for sharing this recipe.